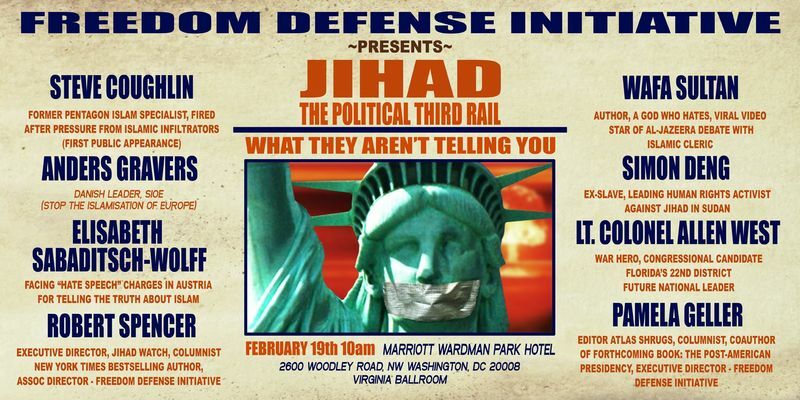 I was shocked to learn that CPAC did not sponsor the FDI event. I was also shocked to learn that one-third of the Jihad attacks since 9/11 occurred in 2009. If you are surprised by that statistic as I was, Pamela Geller places the blame for our collective ignorance directly at the feet of the media and a majority of our elected leaders. “…it could have had the psychological impact of the H-bomb [to Islam] without loss of life….it would demean Muslims by exposing their women because the Muslim male’s honor resides in their women’s bodies…it would have been humiliating and could have awakened and shattered the core of many Islamic dogmas….instead now the TSA has committed to the option of manual pat down by a security agent of the same gender….” — Wafa Sultan regarding TSA Whole Body Imaging Technology and Islam. Major Steve Coughlin: Expert on Islamic law, fired from the Pentagon after pressure from Islamic infiltrators. This was his first public appearance since his dismissal. Anders Gravers: Danish leader of Stop the Islamization of Europe. Mr. Gravers was accompanied by private security who stood guard not only during the conference, but while we were in the hotel bar. He is under constant threat of attack. He commented that he had not spoken to a crowd as large as the audience in the seminar before without a bullhorn. His speech shows us where America is headed if we don’t defeat this enemy now. Elisabeth Saaditsch-Wolff: She has been indicted for “hate speech” in Austria for telling the truth about Islam. Elisabeth has lived in many Muslim countries and has experienced the evils of Sharia law first hand. Lt. Colonel Allen West: Decorated war hero and Congressional candidate in FL-22. More on Lt. Col. West in a later post as I had the distinct honor of meeting and interviewing him while at CPAC. I have linked to the full video of the event. I implore you to watch the whole thing, think about what is presented, ask others to watch it. If we do this we are ensuring that the risks these brave people have taken are not in vain and we are arming ourselves with the Truth. This is a culture war, our enemy is using “lawfare” to marginalize, vilify and silence us. Get educated about the truth of Islam and do not submit. Wow!! Great post. EYE OPENING!!!!!!!! Thanks so much for sharing this important piece of the puzzle. Truth, in contemporary America (and, for that matter, the contemporary “free” world), IS hate speech, as long as the truth doesn’t apply to the Regressive agenda to dialog respectfully about some stupidly inane concept they learned in brainwash school, I mean college. Way to go, Prater. You’re well on your way to earning your own Fatwah This hat, and no doubt making inroads on Big Sis’s “domestic terrorist” list. Really great post. I appreciate you taking the time to sum up the event for those of us not able to attend. Also very pleased to see the full video is available & will be watching tonight! I can just picture the judge to say this… do you swear to tell a lie, the whole lie,and nothing but a lie so help me God? Liberals, the fifth column of Al Qaeda, the purveyor of political correctness and the vehicle for which brings the terrorist in our midst. After the inevitable major successful attack within our shores from the enemy, still the lib will point from the rubble to anything but the truth. Thanks for writing this up. I missed the first couple of speakers in this session at CPAC. It really is interesting (and scary) to see the huge split among conservatives on this issue. It’s not unprecedented historically either. The views expressed on this site are solely mine and do not necessarily reflect those of my clients. Please don't hold them responsible. Momma tried. Copyright © Applecross Media 2010. The content on this blog are the sole property of the author unless otherwise noted and may not be used or reproduced in any manner unless expressly permitted by owner at cprater.applecross@gmail.com. All Rights Reserved.